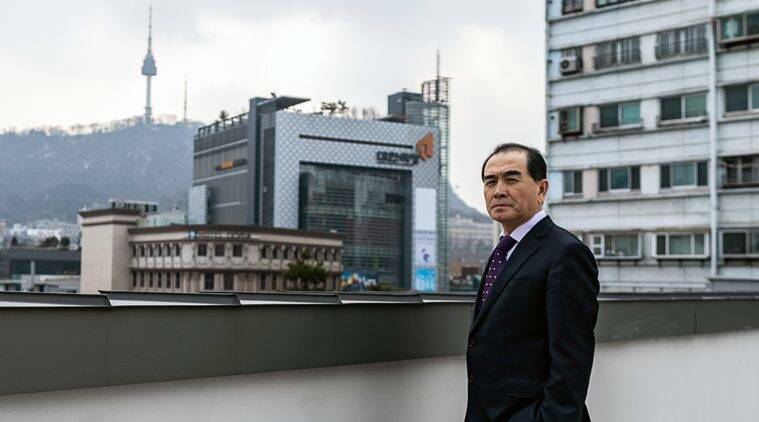 The diplomat, Thae Yong Ho, held embassy posts in Denmark, Sweden and Britain, before a daring escape to South Korea in 2016 with his wife and two sons. Today, he is a target for assassination and kidnapping and lives under the protection of the South Korean government. Kim Jong Un, the mysterious and mercurial leader of North Korea, has no intention of relinquishing his nuclear arsenal, a potent tool that gives him leverage abroad and authority at home, the highest-ranking North Korean diplomat to defect in years said in an interview. The diplomat, Thae Yong Ho, held embassy posts in Denmark, Sweden and Britain, before a daring escape to South Korea in 2016 with his wife and two sons. Today, he is a target for assassination and kidnapping and lives under the protection of the South Korean government. He moves around Seoul, the South Korean capital, in dark sunglasses with a hat pulled down over his forehead. Once a member of the North’s elite political establishment, Thae was educated about the West through movies like “The Sound of Music” and books about bourgeois excess. As a diplomat, he became disenchanted with Kim and sought freedom and opportunity for his children — a sentiment, he said, that is increasingly common among the country’s elite. Jane Perlez, The New York Times bureau chief in Beijing, sat down with Thae before this week’s summit with Kim and President Donald Trump in Hanoi, Vietnam, at which the leaders are expected to discuss nuclear disarmament. Thae, who has written a book and testified before the US Congress, spoke in fluent English. This interview has been edited and condensed. Q: How would you describe Kim? Is he wily? Impetuous? A spoiled brat? A: I think, if we describe him rightly, he is intelligent and bright, but a merciless guy. (His grandfather) Kim Il Sung and (father) Kim Jong Il purged a lot of people, but they never killed family members. Kim Jong Un killed his uncle and half brother. This kind of thing is really unprecedented in the Kim family. Q: Why was Kim so threatened by his uncle, Jang Song Thaek, a senior official who oversaw the National Defense Commission? A: Kim Jong Un felt very afraid of his uncle and felt threatened by even the existence of his uncle. All of a sudden, the whole department under Jang Song Thaek were arrested and the main bosses of that department were shot immediately. All the families — of the hundreds of members of his department — were expelled from Pyongyang to the countryside. All these things took place in a very short span of time — within one week. Q: Is Kim serious about dismantling his nuclear weapons, or is he meeting with Trump out of vanity or to preserve his family dynasty? A: He is just doing this for the preservation of his family. The main goal of Kim Jong Un’s meeting with Trump is first to buy time, and second, get sanctions relief. Finally, he wants the status that comes with being a nuclear power. Q: Who is most threatened by North Korea’s nuclear weapons? A:Kim Jong Un wants his dictatorship and dynasty to go on. If you want to control North Korean society, you have to make South Korea afraid of North Korea. The existence of South Korea is itself a direct threat to the North Korean system. He wants to make sure South Korea stays in South Korean territory, and does not extend it. That is his first goal. Kim Jong Un wants to keep his military in balance with South Korea. But he knows the North Korean military cannot afford modern tanks and guns. He knows this balance is changing unfavorably for North Korea. Nuclear weapons are the only way to keep the balance with South Korea. Q: So, the weapons are not only important in military terms but as a political tool for keeping the society together? He needs an instrument to unite North Korea around him. North Korea’s economy is a failure. North Korean welfare is a failure. The North Korean people do not now believe in North Korean’s system and ideology. So he needs nuclear weapons to justify all of North Korea’s current problems. For instance, North Korean newspapers are educating the people that North Korea is poor. Why? Because North Korea spends so much money on nuclear development, and because of that nuclear development, North Korean became one of the superpowers of the world. So this is a really clear justification of economic failure. Q: Pakistan and India have kept their nuclear weapons and acted quite responsibly. Can North Korea be similarly trusted when it comes to proliferation? A: If America — Trump — does not give Kim Jong Un sanctions relief, Kim Jong Un could do anything. In his New Year’s speech, if you read the text of his speech, Kim Jong Un clarified: He would not further produce, he would not have any further tests, he would not have proliferation of nuclear weapons. But if his demands are not reached, he signaled he would look for a new path. Q: What would that path be? A: In order to survive, he may sell his nuclear technology. Q: Who would buy North Korea’s nuclear technology? A: There are many potential buyers. Let’s say Iran. Iran is under really heavy international surveillance. It’s very difficult for Iran to produce nuclear materials. But, Iran has money to buy nuclear weapons. And how can anyone detect this kind of nuclear sale between Iran and North Korea? Q: What would Kim do with that money? Would he improve his people’s lives? A: Maybe he would use some for economic development and maybe he would update his nuclear arsenal. He knows quite well that, unless he improves North Korean people’s lives, his days are numbered. He would like to do something, actually. He wants to show the people that he is the one actually solving problems. Q: If it is true that Kim’s days are possibly numbered, do you see any chance of a coup? A: Structurally, it is impossible because Kim Jong Un has a very detailed network of surveilling the leaders around him. If you are of high rank, then all the high-ranking officials have to live in the same apartment. They can’t choose where to live. They have to live collectively. You are not allowed to have private time with your friends around you, so the control system of North Korean society is really unimaginable. Q: North Korea’s elites are under sanctions from the world and the United States. They have a tantalizing opening with Trump. What is life like for them, and what is their mood? A: North Korean elites and North Korean society itself is in dilemma at this moment. North Korea is changing. Capitalism and the market system — the concept is spreading quite rapidly in North Korea. Now the people want to solve their daily survival in their own way. They don’t believe in the so-called leadership. They don’t have freedom to travel to foreign countries. They don’t have freedom to have their own cars. If you’re high-ranking you may have a government-supplied car, but the children of those high-ranking officials cannot use their fathers’ government-supplied car. They’re privileged. But their privileges are limited. Q: Have you heard people say, ‘We need to get rid of Kim’? A: I haven’t heard anything because in North Korea you can’t say that kind of thing, even to your wife. So, usually North Korea people don’t open their mouths but you can feel that kind of mood when you live in North Korea.